Why you need a steam basket? 1: Steamed food is a healthy way to prepare food that keeps essential vitamins and minerals, flavors, nutrients and texture in the food, instead of in the boiling water. 2:Without Oil, no more dried out or burned vegetables, seafood. It is really a better nutritious way to prepare your meals! 3: If you have a baby, the steamer rack is perfect for steaming fruit and vegetables for making baby food. 4: The Steamer can be used to cook fruits, vegetables, seafood, and even hot dogs. Boiled eggs good maker,the special egg hole will fix egg stable in put,and it can cooks 1 to 7 eggs the same time in a few minutes. Also use as steam rack, egg steam rack, cooling rack, pot stand rack and so on. Our steamer basket are made of high quality food grade stainless steel. Steaming is a healthier cooking choice, because it can retain more vitamins, nutrients and texture than boiling, microwaving and frying method. This steaming basket rack set can be used to steam veggies, seafood, eggs, meats, desserts, baby food and much more. INNOVATIVE DESIGN - Food grade stainless steel, Versatile with separate basket and rack, the handles on the steamer basket provide ease to lift food from the pot. Not only can it be used as a food steamer basket, but also can be used as a strainer or fruit container. You can also use it to filter extra water when making salad. 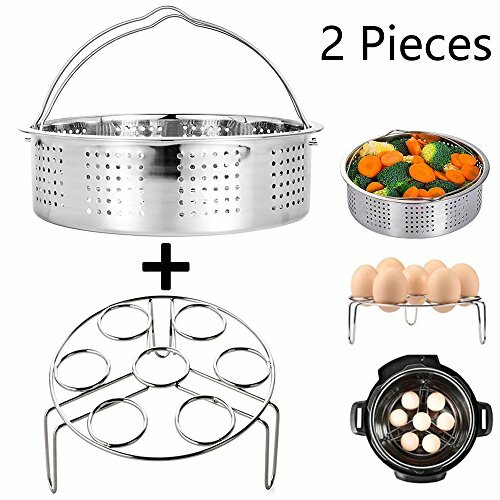 HEALTHIER COOKING METHODS: The egg steamer rack is great for making hard boiled eggs. Cooks your food with steam retains more vitamins, flavors, nutrients, and texture Boiled eggs good maker,the special egg hole will fix egg stable in put,and it can cooks 1 to 7 eggs the same time in a few minutes.